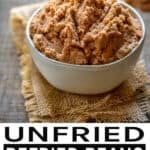 Unfried Refried Beans! Fat-free, low-sodium, vegan and healthy. 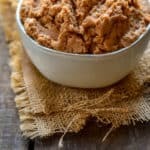 These unfried refried beans are perfect as a side dish or making your favorite party bean dip. Do you love Mexican food? Yeah, me too. Especially, the refried beans. But, there’s a problem. They’re usually cooked with oil, lard and a crap ton of salt. That stuff will jack up your cholesterol and raise your blood pressure. Who needs that? So, how about much healthier alternative that’s extremely tasty? 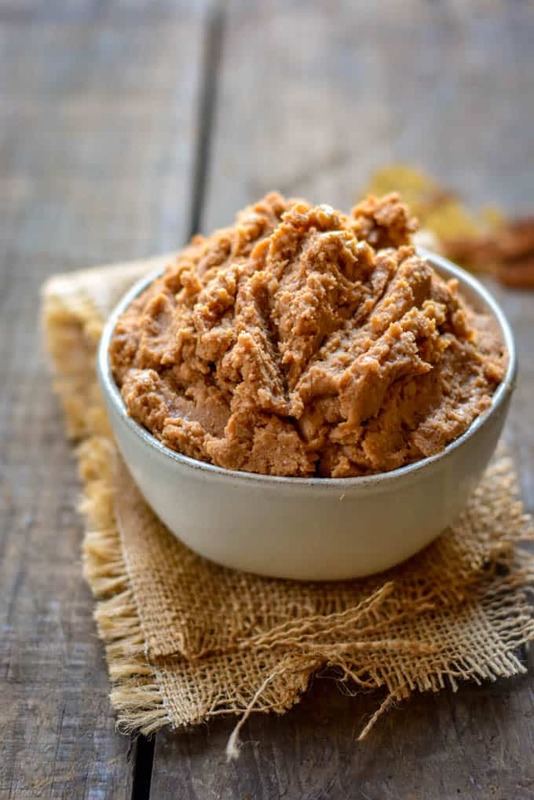 These Unfried Refried Beans are low-sodium, healthy, require no cooking, and have less than 1 gram of fat. Sound good? Yeah, I thought so too. Let’s make some beans! 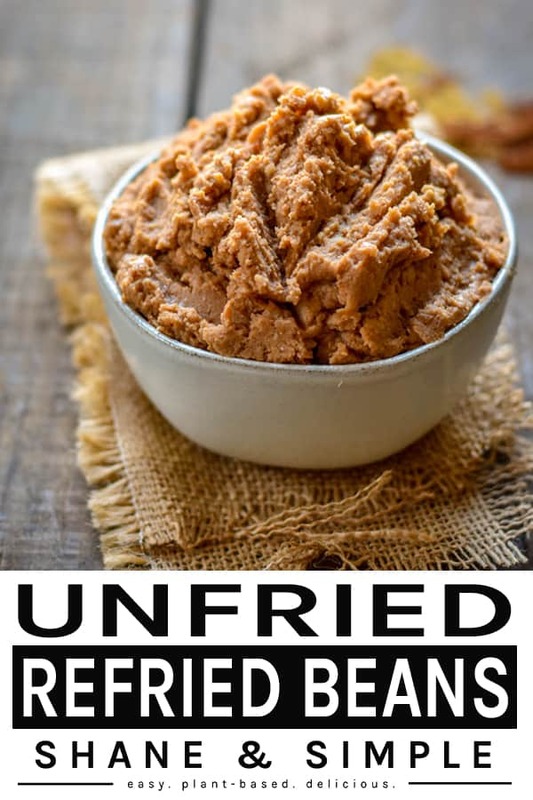 Refried beans aren’t really fried. Just overcooked. But, we’re not even going to be cooking these. You can warm them if you like, but these do just fine without ever turning on the stove. This recipe really couldn’t be any simpler. So, here we go! Rinse and drain two 15-ounce cans of low-sodium or no salt added pinto beans. But, be sure and save 1/4 cup of the bean juice. If you accidentally forget this part don’t worry. You can use water or low-sodium veggie broth. Now, throw the beans and spices into a food processor and start processing. You may have to stop and scrape down the sides but that’s totally normal and cool. Now, start to add a little of the bean juice until you get your desired consistency. Some like their beans thicker while others enjoy a them a little thinner. There’s really no wrong way. It’s totally up to you! 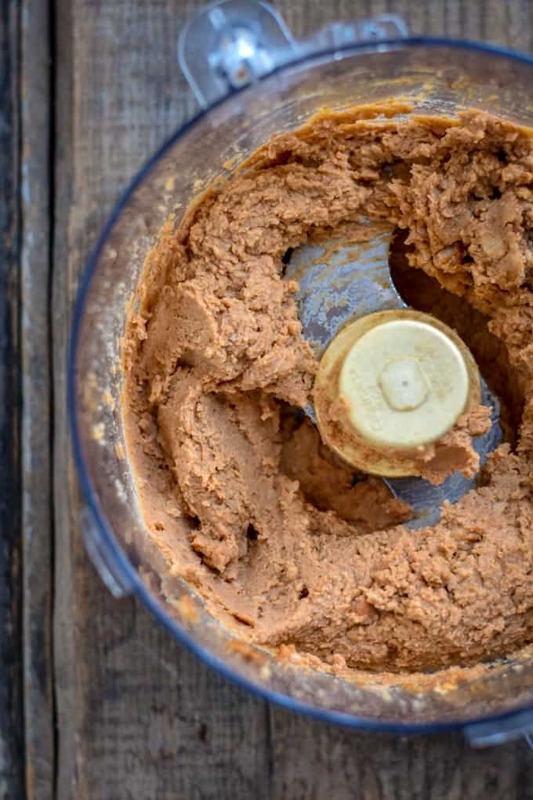 If you don’t have a food processor, not to fear. Use a potato masher. Honestly, it works just as well. It just requires a little extra effort. And, that’s it! Literally, that’s it. But, shouldn’t it be more complicated? Uh, no. I use a basic mixture of cumin, onion powder, garlic powder and chili powder for this recipe. These spices work well for me. And, I don’t like for any one spice to stand out over another. So, I’m always looking for balance. That being said, use whatever you like in the amount you like. The spices are very basic. So, feel free to experiment with others until you find something that suits you. You can also try different types of beans. Pintos just happen to be my preference for this recipe. But, black beans also work very well. Don’t let the simplicity of this recipe fool you. These beans are super versatile. They’re great for burritos, taquitos, burrito bowls or making an amazing 7 layer dip. I realize it ain’t the prettiest dish, but it does have a great personality. And, it’s healthy and delicious. So, what more do you want? If you’re feeling adventurous, try adding a little tahini. 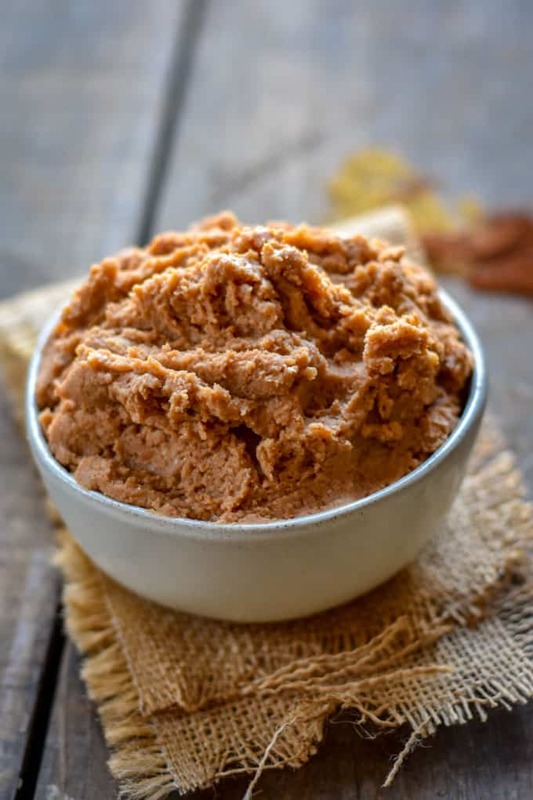 It’s almost like a refried bean hummus. But, I promise it’s good just the way it is. Speaking of dips. 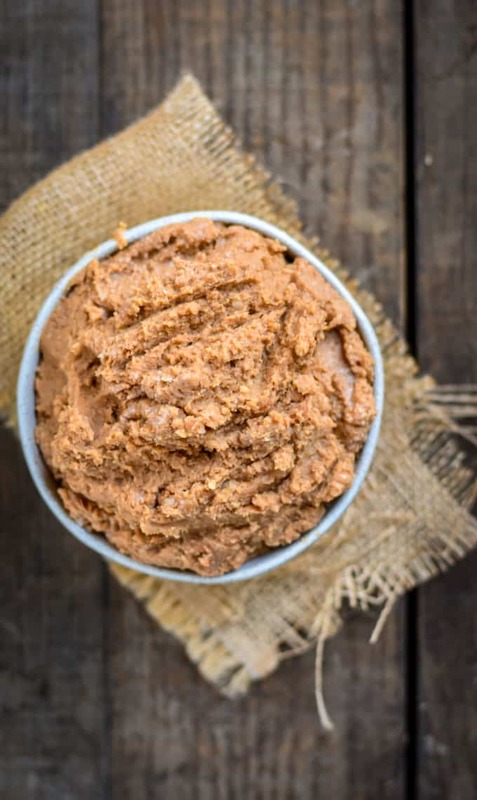 You should try my Vegan Spinach Artichoke Dip, Oil-Free Hummus & Smoky Bacon Flavored Hummus. These beans are also go great with my Quinoa Chipotle Bowl with Southwest Tahini Sauce! 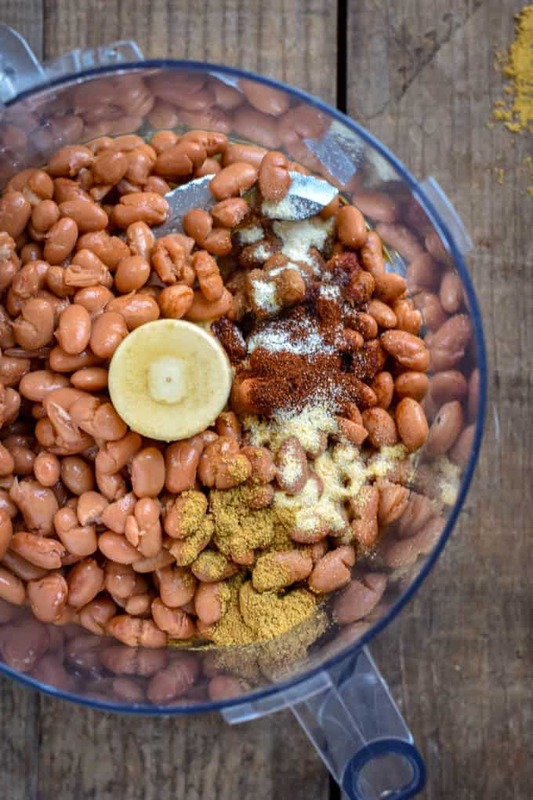 Drain and rinse pinto beans and save 1/4 cup of juice from beans for blending. Place all ingredients into food processor. Pulse a few times to combine the ingredients. Scrape down sides if needed, add a little of the saved bean juice and blend. Continue until you get desired consistency. Serve immediately or store in airtight container until ready to use. You can store in the fridge for up to 5 days. Morning from a snow cover UK. Want to say, again That your food is fabulous. Another brilliant recipe. Thankyou so much for sharing. Barbara, thank you so much for your kind words. I hope you enjoy the beans. Peace. Can you use dried beans? How many cups would you use? Yes, you can use dry beans. Roughly 1/2 cup of dry beans is the equivalent to 1 15-ounce can of beans. Hope this helps. I’m making this with the game day cheese dip for tomorrow!